At some point this year, most of us have been or will be asked, by a well-meaning parent, relative, or friend, how our semester is going. While some of us look past the misnomer, other UChicago students opt for a pithy “I’m actually on the quarter system,” deliberately avoiding having to expand on our 10-week tribulations. Recently, Dean Boyer launched an exploratory committee to consider switching to the semester system. The semester system would bring fewer exams, lighten time pressures for students, and better align with internship schedules, among other changes. However, while the semester system may seem like a novel alternative, it is not the solution to UChicago’s academic stress culture and issues of well-being. Boyer favors the semester system partly because of “the relentless nature of the quarter system…and [the fact that] the semester system would afford our students a better educational learning environment.” Sure, the quarter system can be relentless. There are few, if any, lulls in academic pressure between second week and finals week. Factoring in assignments, midterms, finals, and extracurriculars, students often feel inundated with work. 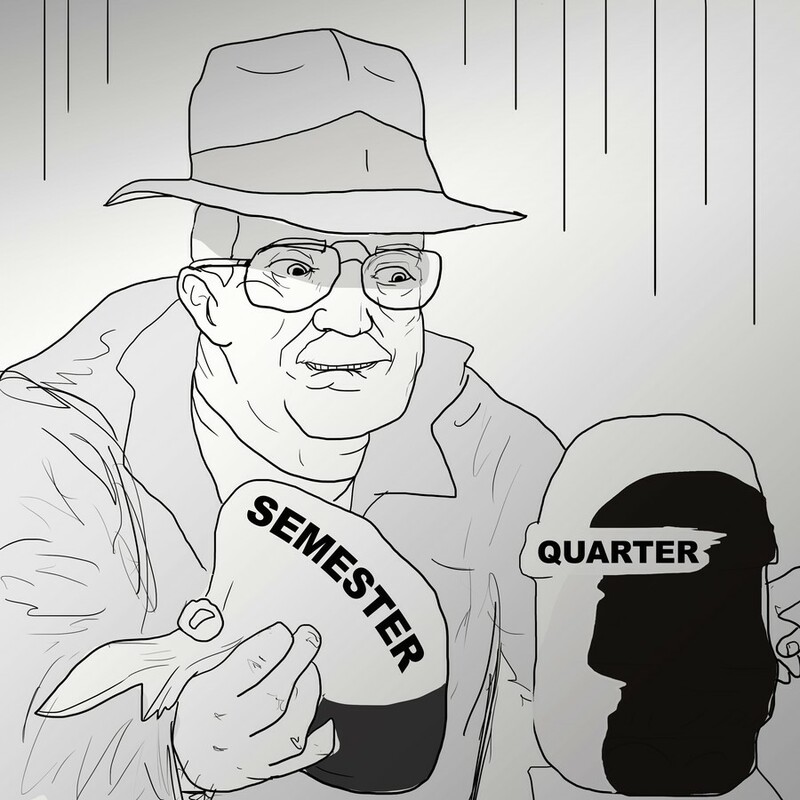 The ever-complaining, five-course taking, five-hour sleeping student comes to mind as the prime example of the arduousness of the quarter system. But the semester system isn’t the solution to these problems. This shift wouldn’t be the golden bullet that would alleviate the massive amounts of stress currently affecting UChicago students. Although class material may be taught over a longer period of time, the breathing room afforded to semester system students comes at a cost. The hiatuses in academic pressure in this system can disincentivize students from managing their time well, and lead to cramming during the weeks leading up to finals. The quarter system incentivizes students to keep up with their work—falling behind is ruinous, so students are more likely to stay on top of things. That isn’t to say that the incessant motion of UChicago academics is faultless—the quarter system certainly brings heavy workloads and pressure that can lead to burnout. The quarter system also penalizes students that get sick, as time to catch up is scarce—professors may need to be more lenient with such students and perhaps adjust the workload on a case-to-case basis. Nonetheless, rather than switch to the semester system, the administration needs to work on addressing the culture of stress at UChicago at large, restructuring finals week and improving the outreach of Student Health programs. The academic rigor resulting from the quarter system is very much a part of UChicago’s identity, but it doesn’t need to come at the cost of students’ well-being. Boyer’s exploratory committee should focus on prioritizing these issues over switching to the semester system, which may just be a copycat tactic that does more to conform to the schedules of UChicago’s peer institutions than it does solve rampant academic stress issues. Furthermore, the flexibility of the quarter system allows us to take more classes than we’d be able to enroll in under a semester system. This not only helps students who want to take a wide range of classes, but also allows for specialty courses that don’t have a year’s or half a year’s worth of content. Many of the Signature courses currently offered may not have enough organic content to justify existing as a longer course in a semester system. From a student’s perspective, the quarter system means more tests—three sets of midterms and finals in a year, instead of two. However, exams in a semester system might cover larger amounts of material, and thus might be more difficult to prepare for and be worth a heftier chunk of students’ overall grades. I’m no academic purist, but I’m willing to pay the cost of extra tests to be able to take the classes I want to take. On a similar note, planning out your courses over four years is easier with the quarter system. Having 12 quarters (not including summers) to take courses is better than having eight semesters for a variety of reasons. If you don’t get into a class you want or need to take for your major, the semester system leaves less room for scheduling for the long term. In terms of registration, the downside of quarters is that students must navigate the enigmatic and often frustrating pre-registration process three times a year, while scheduling classes and enrollment is also more difficult for the administration, especially given the growing student population. However, there are less extreme solutions to these logistical issues than a switch to the semester system; one potential solution might be to slightly increase class sizes or to build more classrooms and hire more faculty, although I admit this is much easier said than done. The semester system is indeed more convenient for accommodating internships at the end of the academic year. Although some organizations are cognizant of UChicago’s calendar, some require students to join as early as the 10th week of classes, which disrupts finals scheduling. In fact, some students can’t even apply to their dream internships because of such scheduling conflicts. While switching to the semester system solves this problem, it could just as easily be remedied by starting and ending the academic year slightly earlier. Yet it doesn’t make sense to drastically alter our academic calendar solely to accommodate the needs of companies when UChicago prides itself on not being overly pre-professional. That being said, the reality is that internships do matter; regardless of what system we are on, students will continue to apply to them. It’s high time that UChicago realizes that making it more difficult for students to apply to internships is no help to their personal, academic, and professional success. However, this realization is not a call for a shift to the semester system either, not when there are much simpler solutions available. Boyer himself admitted, “I doubt that the University will ever abandon the quarter system. We have had it since 1892, and it seems to have become a permanent fixture of our identity.” Although juxtaposing the two systems does unearth some of the deficiencies of the current one, there are solutions to the issues of incredible academic stress and a less-than-ideal academic calendar that do not involve the massive overhaul required to switch to the semester system. Dean Boyer’s committee and the administration should focus on combating these issues without relinquishing the distinctive scholastic values that make UChicago a bastion of rigorous inquiry and academic challenge.